The Art Gallery of NSW is the perfect mid morning attraction to visit when in Sydney. A stroll through the lush Domain with the sun kissing your face, a view of our famous sky line towering behind you and the 18th Century architecture of the Gallery before you. I’ve decided that 2010 will be a year for exploring my own city and what better way to start then with the cultural heart of Art. I’ve also heard about some fantastic temporary exhibits that were must sees. 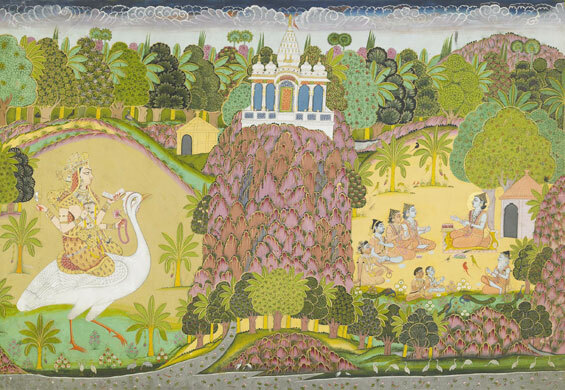 Currently the Art Gallery of NSW is Celebrating Indian art and culture with its INDIAN SUMMER. The exhibition includes The Royal Paintings of Jodhpur, Garden and Cosmos. The artworkd are from the 17th-19th Century and are a truly great experience into the world of India. As we were there at 1.30pm, we were lucky to catch the free holiday performance dances. From 5-7 Jan is Dancing Ganesha. From 12-14 will be Krishna and 19-21 Jan will have Shiva, the cosmic dancer. Apparently it was for the kids but if the other adults were anything like me, they were overjoyed to catch this cultural display. Catch the dancing and many other free special events running right up until January 26th 2010. The longstanding artworks in the Contemporary, Asian and Aboriginal and Torres Strait Islander art wings did not dissappont either. The Australian art was of particular interest to me and I was very impressed by some of our home grown talents. The likes of W.C. Pigenuit, Arthur Streeton and Tom Roberts are credits to the Australian Art Society. I was particularly enamored by Tom Roberts Holiday sketch at Coogee, 1888, a great representation of early life in Australia and one of Sydneys most popular beaches. I suggest getting to the Art Gallery before 14th February so that you don’t miss the wonderful outdoor exhibit by Tatzu Nishi. I was surprised and delighted by this large scale piece at the entrance to the museum. I can’t spoil it by telling you what it is, but I will say, it’s a must see! Visiting the Gallery around lunch time has the benefit of indoor and outdoor seating at the cafe which overlooks the Harbour of Wooloomoolloo, allowing you to enjoy Sydney’s amazing vistas as well as its cultural delights. The cafe is very reasonably priced and they are serving a fresh and tasty range of lunch items. A delightful day and very educational. The Art Gallery of NSW is free of admission for the permanent collections with variable pricing for the temporary exhibitions. It’s a great day out with the family as it is located in one of Sydney’s most beautiful viewpoints. Take the train to Martin Place and wander through the greenery of the Domain and finish by returning to Martin place for a coffee and treat at the Lindt Cafe. Have a great day!